Visiting Da Nang – one of the most lively and dynamic metropoles in Vietnam – can be confusing because of how many amazing things there are to do. If you can’t make up your mind, then check out Ba Na Hills – the place attracted so much hype. Located 1,489m high on Nui Chua mountain, the world-class resort and amusement park are one of the top destinations in Vietnam with its glorious weather and gorgeous view, not to mention many awesome man-made attractions such as the Golden Bridge. Read on to get all you need to know about Ba Na Hills. How to get to Ba Na Hills from Da Nang? What to do in Ba Na Hills? Is Ba Na Hills worth a visit? Ba Na Hills began as a hill station and resort made by the French in 1919. Ba Na was stumbled upon by a French captain named Debay who was looking for a suitable site to build a resort. After that, the colonial government invested heavily in the place, turning it into a top holiday destination. However, when Vietnam was convulsed in wars, Ba Na eventually fell into oblivion. It was not until a decade ago that the “Sleeping Beauty” awakened again to great fame. According to some sources, “Ba Na” means “my mountain” in the Katu language, the tongue of the local ethnic tribe. Some other explanations are less convincing but more funny. For example, it is claimed the place was full of banana plants when the French first found it so they called the place “banane”, the French word for banana. The Vietnamese then rendered it into Ba Na. Located just 20 km west of downtown Da Nang city, Ba Na Hills features breathtaking natural landscapes, lush green mountains, and awe-inspiring architectural buildings. You can either get there by many means of transportation. The easiest way is to go by bus with a two-way ticket costing between 120,000 VND and 150,000 VND (~US$5-7). Local buses always run on a fixed timetable, so make sure to keep the schedules in mind! Another option is to take a taxi which is more convenient but also costs you three or four times as much as going by public transport. You can also use Grab, a ride-sharing app extremely popular in Vietnam, to book a car. This is much cheaper than taking a traditional taxi. Meanwhile, if you are looking for a real adventure or a true test of your driving skills, renting a motorbike at your hotel is an interesting choice. It only costs about 80,000 VND to 150,000 VND (~US$3.5-6.45) and offers total freedom of traveling as long as you can navigate Vietnam’s notorious traffic. Last but not least, it is also possible to book a private transfer. Sign up for a private tour with an English guide and you will be personally picked up at your hotel to visit Ba Na Hills, both safe and convenient. – You can just buy tickets directly from the ticket booths or kiosks at the entrance. This would be quite simple, except for the fact that there are often long lines at the counters. Even if you are lucky enough not to stand in line forever, buying a ticket this way is still unadvisable because you have to pay the ticket price in full which is VND 700,000 (~US$ 31) for adults and VND 600,000 (~US$27) for children 1-1.3 meters tall. – What we would recommend is thatyou can simply sit back and get online tickets at home. Doing so will relieve you of having to fight the crowds for some tickets as well as help you seek a bargain. 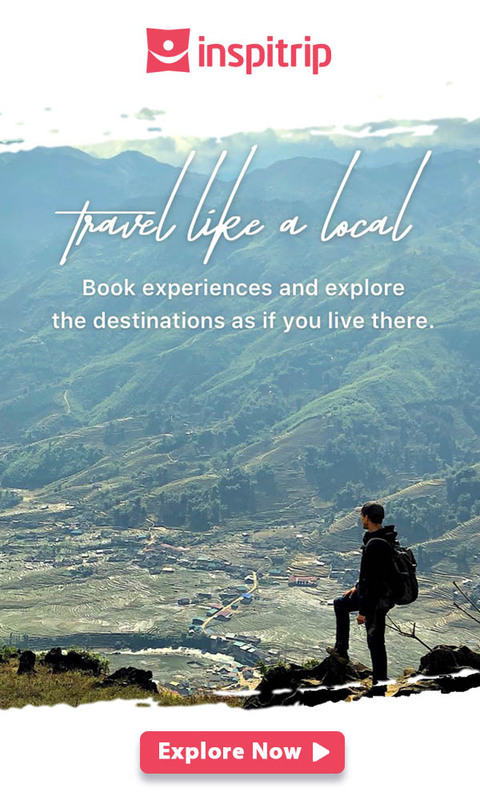 Inspitrip is the best platform to purchase tickets online with discounts regularly being offered, making the ticket price more affordable than ever. 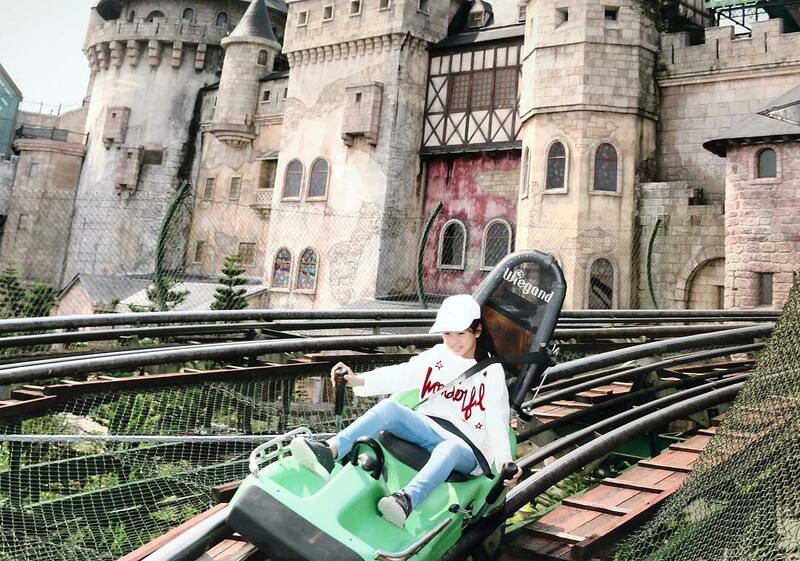 Also, it offers skip-line ticket combined with well-planned tour to Ba Na Hills. One of the most terrific things about Ba Na Hills is its unfailingly glorious weather. Whenever you get the chance to visit, you can always expect a fair day with fog and cool air. 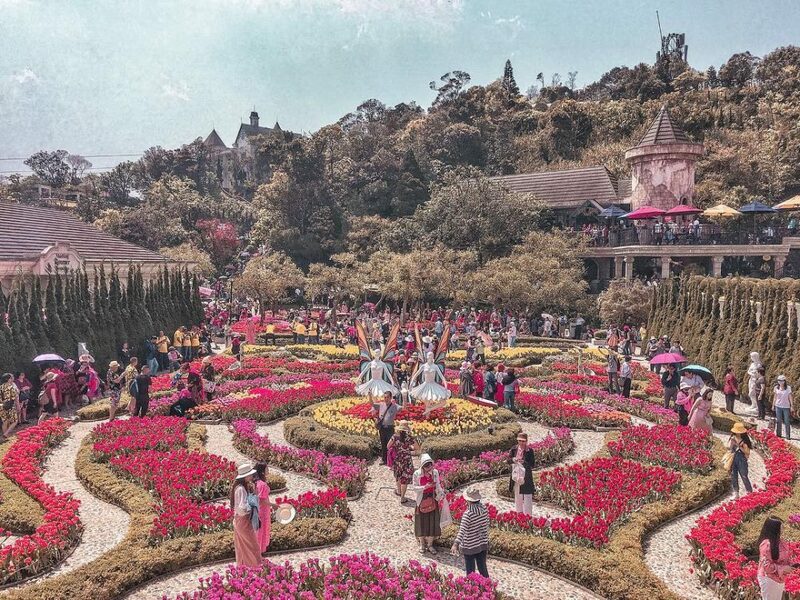 However, Ba Na Hills is at its most crowded from April to August which is the peak season. Therefore, you may consider planning a trip between September and March. An umbrella in your suitcase would be nice if you choose to go there in September and October, when it is likely to rain. 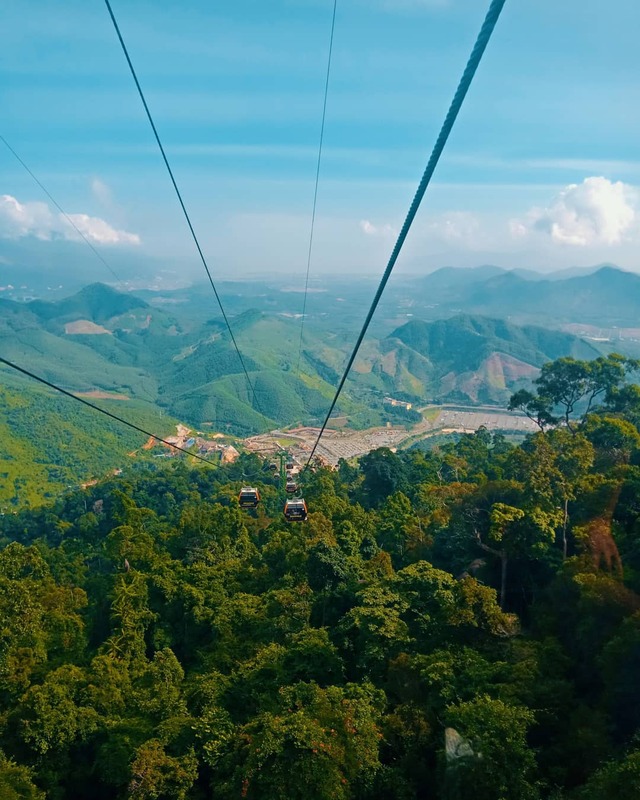 The Ba Na Cable Car has, among other things, the widest gap between stations and the greatest change in elevation according to the Guinness World Records. A cable car system always mars the natural scenery and makes a destination less aesthetically attractive, right? Not the one in Ba Na Hills which is a spectacular record breaker. The Ba Na Cable Car, which was built according to European standards, is 5,801 meters and reaches the astonishing height of 1,368 meters. These achievements have remained unrivaled to this date. Taking a cable car, you will be rewarded with the spectacular coastal landscape along the way. 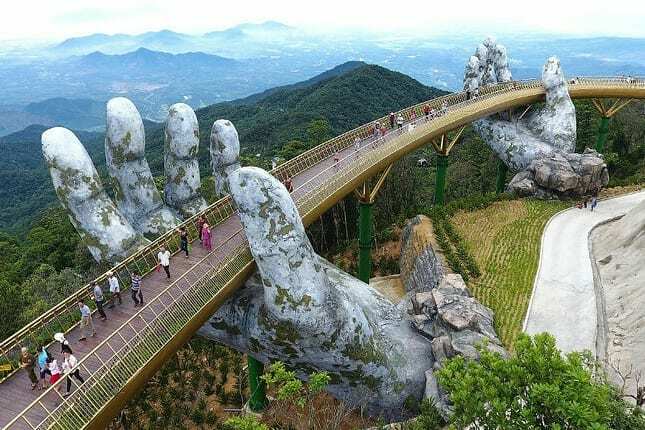 Walking on the Golden Bridge is likened to “walking through the hands of God God”. Your trip to Ba Na Hills wouldn’t be complete without stopping by the iconic Golden Bridge. Opened in June 2018, it took many years to build but only a few days to become a must-visit spot for travelers to Danang. The 150-meter-long bridge has drawn admiration as it is skillfully built in the middle of the mountain and graciously covered in attractive gold. What is even more special about the bridge is its huge supporting columns deftly created in the shape of colossal, godlike hands. 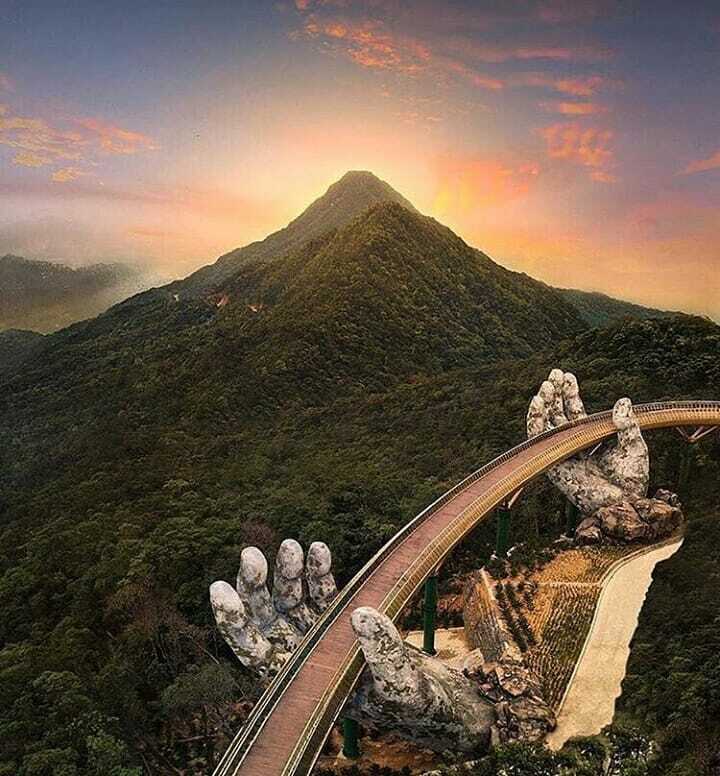 Indeed, standing on the bridge where you can touch white clouds and beholding the surrounding rugged mountains and the beautiful landscape down below is an exhilarating feeling. Le Jardin d’Amour is literally translated as the Garden of Love. Stepping out of the Golden Bridge, you will arrive at the Paradise of Flowers, or Le Jardin d’Amour, to be à la mode. As suggested by its name, this place is truly a heaven for fans of beauty and fragrance. The Paradise is divided into 9 gardens, each of which has its own architectural style inspired by Occidental or Oriental mythologies. Some of the most attractive gardens are Suoi Mo Garden with numerous local brilliant flowers, the Sacred Garden which has witnessed many couples’ exchange of vows, and the Mysterious Garden whose tree maze has amazed a lot of adventurous visitors. The Paradise is also dotted with beautiful life-like statues, increasing the glamor of the site. Morning at The French Village of Ba Na. While modern feats of engineering have brought fame to Ba Na Hills, the site doesn’t lack historic attractions that can invoke a strong sense of nostalgia. One such place is the French Village which is situated on the top of the mountain. When the French transformed Ba Na from an untouched land into a holiday destination, they put up a lot of French style houses and buildings. They still stand today, as if indifferent to the passage of time. At the heart of the village is the gorgeous St. Denis church whose design was inspired by the Denis Cathedral in France. There are also many medieval bars and restaurants around where you can have a meal in style. After that, it would be great to stay at the nearby high castle resort to both relax and enjoy a panoramic view of the city. 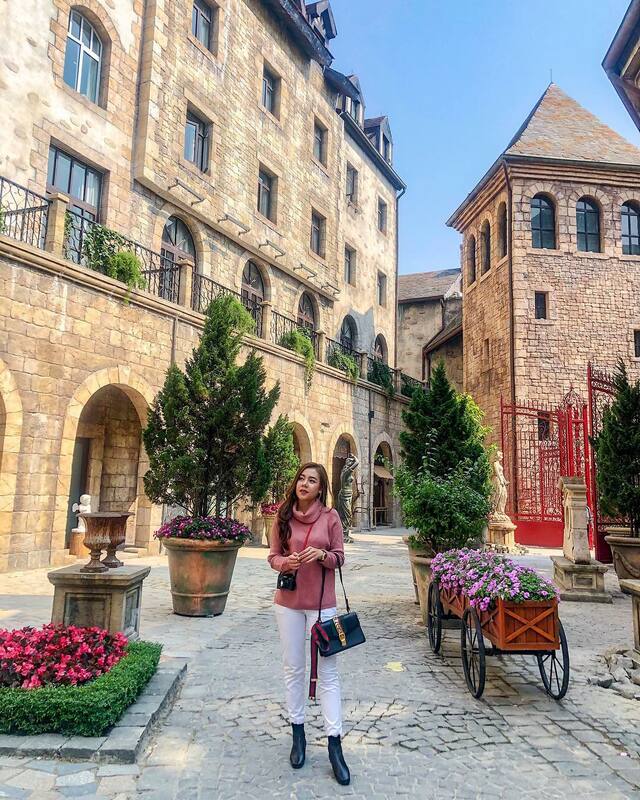 Walking on the cobblestoned alleyways and savoring the fair weather that Ba Na is blessed with, you can start imagining that you are somewhere else in Europe. 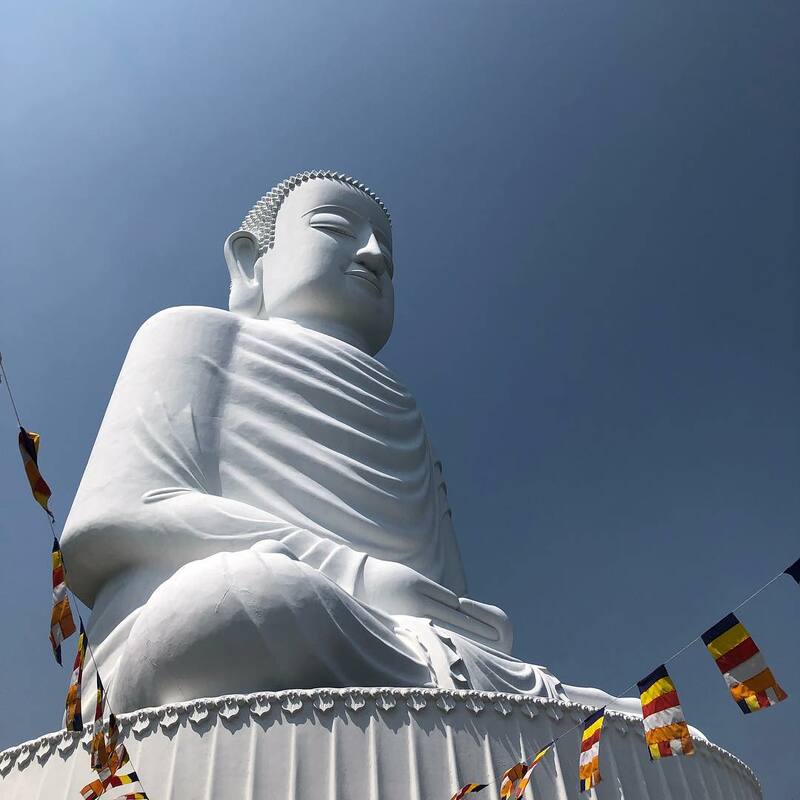 The solemn statue of Shakyamuni Buddha. Many excellent food stalls and restaurants throughout Ba Na are ready to satisfy your insatiable appetite, but where to find food for soul? It would be a great idea to visit Linh Ung Pagoda, a remarkable pagoda and one of the top attractions in Vietnam. Located above an elevation of 1,500 meters, the pagoda is an ideal place to relax and meditate. Remember, though, that there are up to three pagodas called Linh Ung but only the one in Ba Na Hills has the giant statue of Buddha. The statue is 27 meter high, almost on a par with Christ the Redeemer, the famous statue in Rio de Janeiro. Ba Na Hills Fantasy Park. 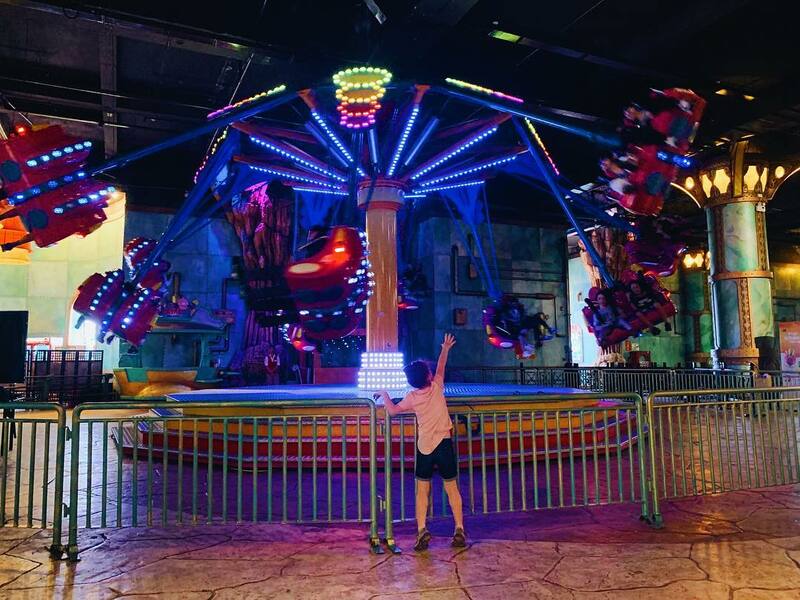 Adults can easily get immense pleasure out of Ba Na’s scenic view and architectural marvels, but how about restless kiddos? Fear not as the Fantasy Park is there for the whole family. A theme park inspired by Jules Verne’s classics, the Fantasy Park allows children to have fun by indulging their imagination. The activities available include the 4D Death Race, the 29-meter-high Drop Tower, and several 5D cinemas. The wax figures are created by Italian sculptors and artists. Imagine being able to tightly hold Captain Jack Sparrow or Queen Elizabeth II in person? 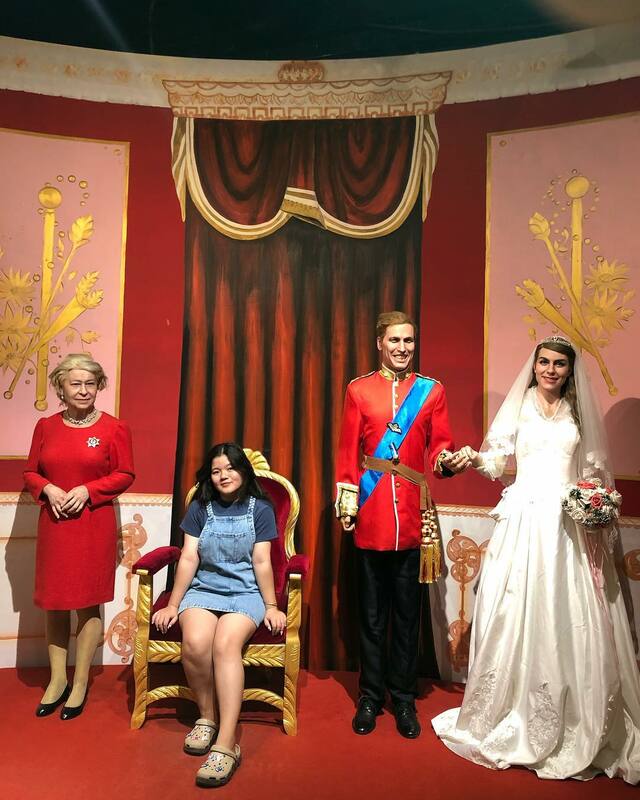 At Ba Na Hills Wax Museum your dream will come true. The museum, which displays various wax figures of some of the world’s most famous people, is the first of its kind in Vietnam. In fact, visiting the museum has become one of the most interesting things to do in Da Nang. However, the ticket to the museum is not covered by Ba Na Hills entrance ticket. Therefore, you have to pay an extra of VND 100,000 (~US$4.5) to visit the site. Ba Na Hills Alpine Coaster. Though the Fantasy Park has plenty of rides, the Alpine Coaster that spans over the dramatic mountainous landscape is definitely worth trying. At a speed of 40km/h, the coaster would give you a really thrilling experience with fresh mountain breeze grazing your face. Each ride comes with a hand brake that allows you to control your own speed, so you can choose to go faster or slow down according to your liking. Absolutely yes. Imagine a beautiful mountainous landscape with otherworldly beauty, architectural marvels, mechanical feats, and historical settlement – that is Ba Na Hills. It lies in the majestic Truong Son Mountains that guard Vietnam’s coast, waiting for you to explore its charm. That is the one place where you can see four seasons come and go within one day or have a European experience in the Vietnamese setting. So what are you waiting for?